Celebrate with us – 1Mio DayOne downloads! christianscholz 2019-03-31 2019-04-03 No Comments on Celebrate with us – 1Mio DayOne downloads! It’s finally happening: In April, the Juniper DayOne Books will hit 1Mio downloads! 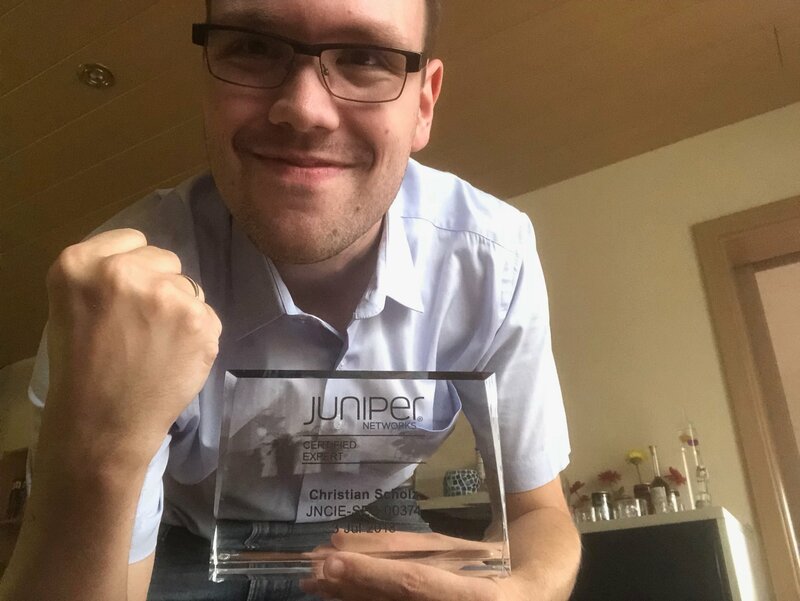 https://www.juniper.net/us/en/dm/day-one-million/ from time to time during April for special discounts and exclusive bundles. But hey – why is your story in German you might ask. I did this because of 3 reasons. First, most of the Germans are a bit lazy when it comes to interacting with others in English. Don’t ask me why (I’m not a typical German in many ways) but I experienced this over and over again. Therefore I decided that it would be interesting to add a little German to the stories so more “native” Germans would be able to see, how awesome this journey was for me. We were told that we could either write in English or in our native language – and guess what? Maybe we should start a “Multilanguage DayOne Book” where the books are either written in different Languages per recipe or we take one book and translate it into as many Languages as we can find? I would be in of course. Second, diversity is great and it’s always a difference if someone has to write in his native language or in English (subtext is the buzzword here) and the more people contribute in other languages, the better. I love to learn new things – why not learn a few words of Spanish, French, Canadian, Italian or whatsoever? There’s also a third reason for this – if you want to know it, feel free to reach out to me. My fellow ambassadors already mentioned some Ideas on Twitter – stay tuned. What could be more refreshig than setting up a nice little EVPN-VXLAN on your vQFX just for fun? This blog post will show you how to do it and break down the important parts. In case you already know EVPN and just want to take a look at the sample-config, you can jump at the end of this blog post, where I post the full code for the setup (excluding Windows Server NIC-Teaming with LACP). If you want to know how to use NIC-Teaming on Windows Server 2016 simply go to google – there are tons of instructions (with LACP and without) but this setup uses one with LACP. Step1: Create the Topology itself. Before implementing EVPN-VXLAN you should carefully think about your setup. I’ve seen a lot of setups where the spine and leaf topology is placed “unoptimal” and later on might cause trouble. Therefore I advise you to think carefully about the topology itself and also about the surrondings that you might need (like route-reflectors or VC-Fabrics). Once you got that out of the way it’s time to sit down and build the setup and prepare the connections needed – for my tests I usually use EVE-NG because with EVE-NG it’s very easy to “patch” all the cords needed on the fly (with Pro even when the devices are powered on). I advise you to always PoC a setup like this to avoid unnecessary surprises when implementing it. Usually when prepping this and doing a PoC there are many things that you might see different after the PoC – this will help you to find the optimal setup for your company. You can edit the adress-schema as you like – I personally use the 172.16/16 quite often for my labs and setups, where I need private v4 adresses. Your underlay will be vital for your Overlay – obvious right? But this part can be tricky – especially with route reflectors. In our case, we will make it simple by using plain EBGP. 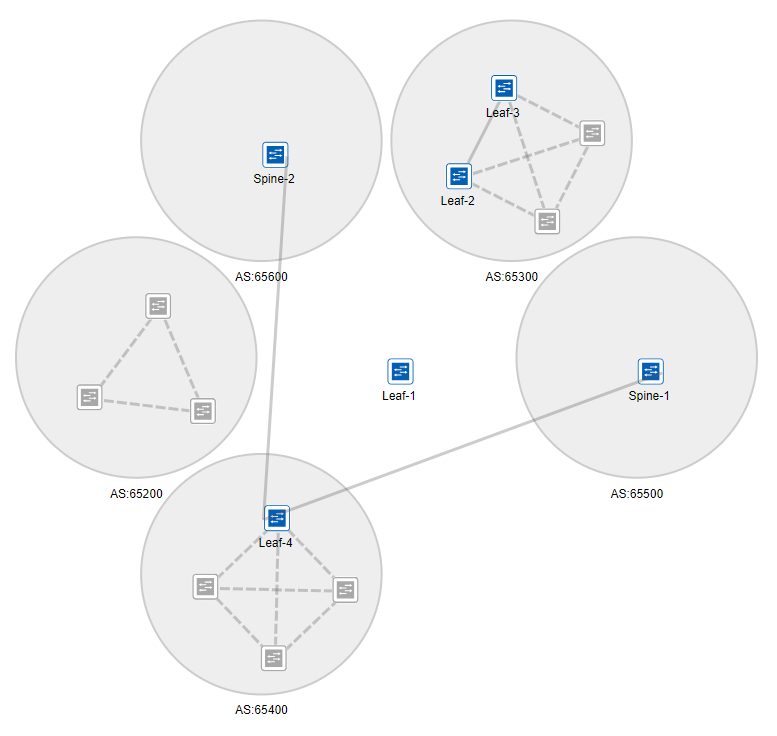 You could, of course, use OSPF for your underlay network but the drawback is scaling – most customers use EVPN because VC, VCF, JunOSFusion and so on do not scale out the way EVPN does it. And when comparing OSPF vs BGP in terms of scale – well – you already know who will win, right? 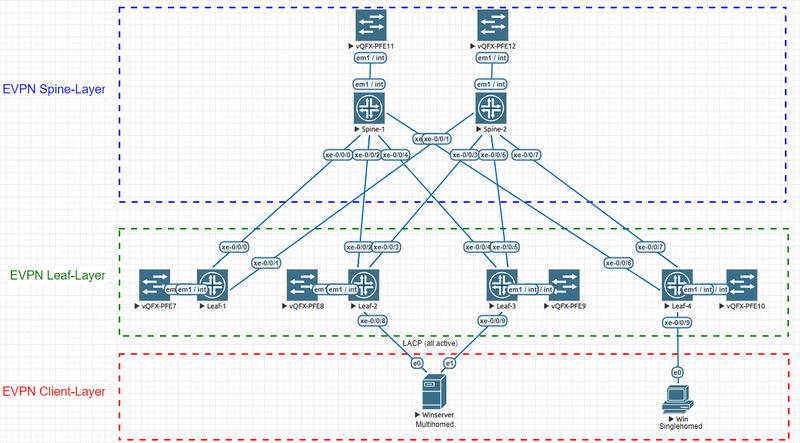 After doing this on all spines / leafes (of course with different AS-numbers and IP’s) you should have a nice BGP-Fabric. 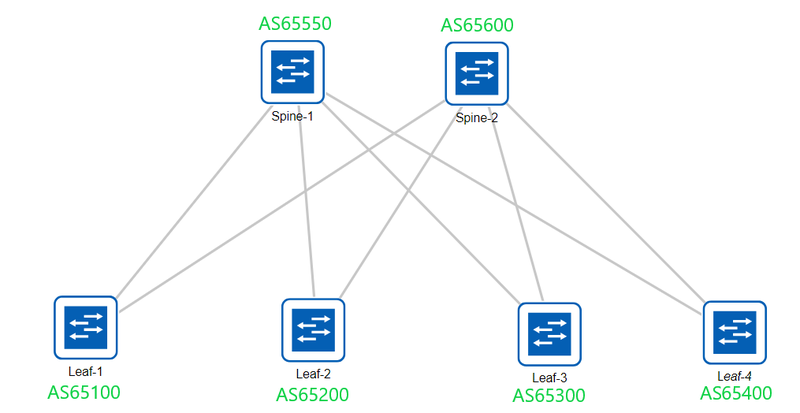 Now it’s time for the funny part – the EVPN-VXLAN overlay. Now it’s time for your loopback-address to really shine. Doesn’t look scary if you break it down, right? The key in complex setups is to break the config down to smaller parts. This way, you can solve almost any problem. Congrats – your EVPN is just a commit away. Do it – this part is about what happens “after the BANG”. At this point your EVPN should be up and running – YAY. But what now? How can we check what the EVPN does for us? Lets get to it. As you can see, in the given Topology, our bgp receives routes from the underlay and also our bgp.evpn gets Infos from our overlay. So far so good. But what about our EVPN-Database? Sweet – our 2 Hosts are already inside the EVPN-Database and as you can see, one is multihomed and one is single-homed. You can immediately see that because the Active source is different. While the multihomed Server is sourced from an esi (hence the esi-number as source) so basically from multiple leaf devices, the single-homed device is sourced from the leaf device with the loopback address 172.16.40.1 (Leaf-4). Now imagine each leaf device resides in a different DC or Building – no more do you need to worry about DC stretching – all you need is a solid underlay to build your Infrastructure on. 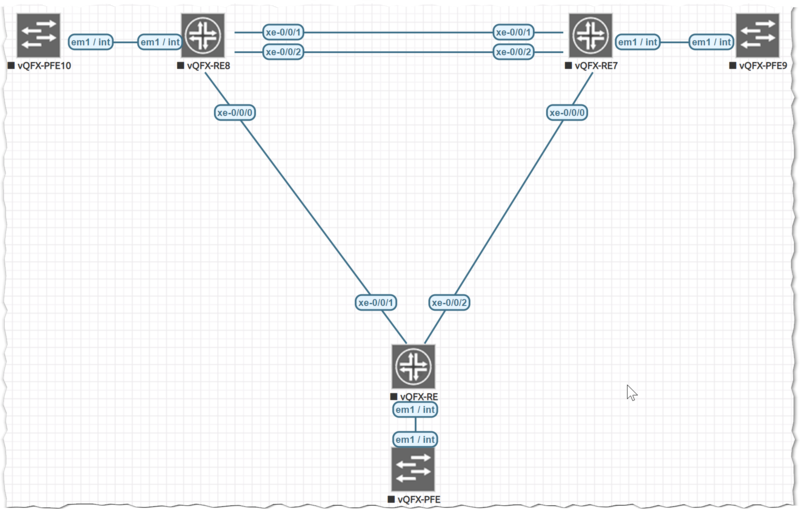 With Contrail, managing your EVPN-VXLAN is even more convenient – but that will be written in a later blog post. I also tried to add it to JunOS Space, because you can (thanks to EVE-NG) link your Lab to the real world and discover all the devices into your JunOS Space. I was actually impressed, that the vQFX can be added to Space (just discover them with ping only and add snmp later, else the discovery will fail because of the snmp string that is used by the vQFX). Hopefully you now have less fear, when someone mentiones EVPN-VXLAN. 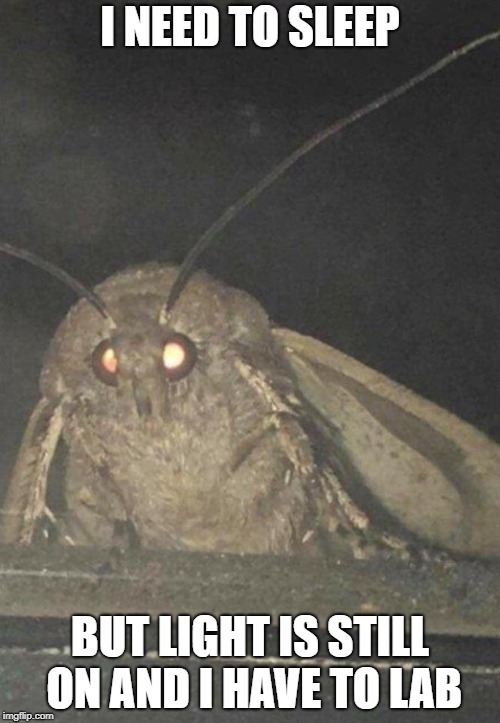 set system root-authentication encrypted-password "$6$rB5kPIFJ$91QMtJeCLoVn1o.TN5fPMhQF44MyQXrN0yfMn4Br6lasdBcdyX.XuHE7zYdAC8t4M07icNaSjlusHlVdu4Bxy." set system root-authentication ssh-rsa "ssh-rsa AAAAB3NzaC1yc2EAAAABIwAAAQEA6NF8iallvQVp22WDkTkyrtvp9eWW6A8YVr+kz4TjGYe7gHzIw+niNltGEFHzD8+v1I2YJ6oXevct1YeS0o9HZyN1Q9qgCgzUFtdOKLv6IedplqoPkcmF0aYet2PkEDo3MlTBckFXPITAMzF8dJSIFo9D8HfdOV0IAdx4O7PtixWKn5y2hMNG0zQPyUecp4pzC6kivAIhyfHilFR61RGL+GPXQ2MWZWFYbAGjyiYJnAmCP3NOTd0jMZEnDkbUvxhMmBYSdETk1rRgm+R4LOzFUGaHqHDLKLX+FIPKcF96hrucXzcWyLbIbEgE98OHlnVYCzRdK8jlqm8tehUc9c9WhQ== vagrant insecure public key"
set system login user vagrant authentication ssh-rsa "ssh-rsa AAAAB3NzaC1yc2EAAAABIwAAAQEA6NF8iallvQVp22WDkTkyrtvp9eWW6A8YVr+kz4TjGYe7gHzIw+niNltGEFHzD8+v1I2YJ6oXevct1YeS0o9HZyN1Q9qgCgzUFtdOKLv6IedplqoPkcmF0aYet2PkEDo3MlTBckFXPITAMzF8dJSIFo9D8HfdOV0IAdx4O7PtixWKn5y2hMNG0zQPyUecp4pzC6kivAIhyfHilFR61RGL+GPXQ2MWZWFYbAGjyiYJnAmCP3NOTd0jMZEnDkbUvxhMmBYSdETk1rRgm+R4LOzFUGaHqHDLKLX+FIPKcF96hrucXzcWyLbIbEgE98OHlnVYCzRdK8jlqm8tehUc9c9WhQ== vagrant insecure public key"
set interfaces xe-0/0/0 unit 0 description "to Leaf 1"
set interfaces xe-0/0/2 unit 0 description "to Leaf 2"
set interfaces xe-0/0/4 unit 0 description "to Leaf 3"
set interfaces xe-0/0/6 unit 0 description "to Leaf 4"
set protocols bgp group underlay description "to Leaf 1/2/3/4"
set interfaces xe-0/0/1 unit 0 description "to Leaf 1"
set interfaces xe-0/0/3 unit 0 description "to Leaf 2"
set interfaces xe-0/0/5 unit 0 description "to Leaf 3"
set interfaces xe-0/0/7 unit 0 description "to Leaf 4"
set interfaces xe-0/0/0 unit 0 description "to Spine 1"
set interfaces xe-0/0/1 unit 0 description "to Spine 2"
set protocols bgp group underlay description "to Spine 1/2"
set interfaces xe-0/0/2 unit 0 description "to Spine 1"
set interfaces xe-0/0/3 unit 0 description "to Spine 2"
set interfaces xe-0/0/8 description "to Server"
set interfaces xe-0/0/4 unit 0 description "to Spine 1"
set interfaces xe-0/0/5 unit 0 description "to Spine 2"
set interfaces xe-0/0/9 description "to Server"
set interfaces xe-0/0/6 unit 0 description "to Spine 1"
set interfaces xe-0/0/7 unit 0 description "to Spine 2"
set interfaces xe-0/0/9 description "to Client"
today I’m gonna show you how to implement MC-LAG on the vQFX (QFX10k codebase) on EVE-NG. I personally found this pretty straight forward to configure but since I recieved so many Mails asking me to show this, I will do. Just 38days of labbing until the JNCIE-DC Exam-Day has arrived. I would love to share some EVE-NG Topos – however, I only work with the official inetZero Superlabs this time and therefore can’t legally share anything. With 2018 slowly fading away, I did a recap of this Year (Certification wise). 2018 was probably my toughest Year yet – but also my most exciting so far. My Goal was to get my first Expert – I got way more than I expected. Just FYI – 15.1X49-D160 for the vSRX came out today. Tested with EVE-NG PRO (2.0.4-98) – no issues so far.